List of TS Residential Schools in Telangana State, TSR Schools salient features, facilities: TREI Society has established Residential Schools with an objective to provide quality education to the talented children. 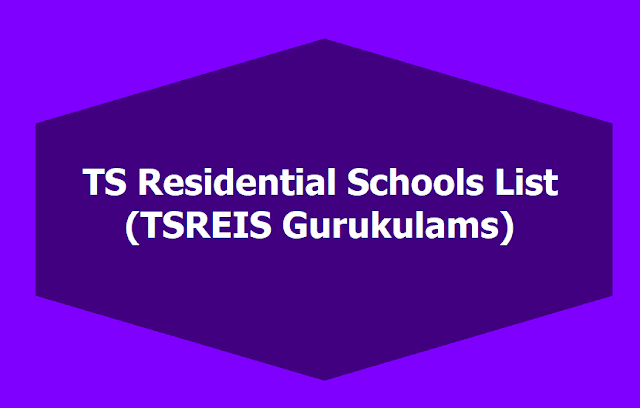 Presently, TSRIES/TREI Society is managing the following TS Residential Schools for Boys and one for Girls. Facilities of TSR Schools: There are good infrastructure facilities in addition to well equipped laboratories, libraries, reading rooms and play grounds with well equipped physical education department. The Schools offer free education besides free boarding and lodging facilities to all selected candidates. Special care will be taken for talented as well low achievers. Loco parent system is adopted to look after and guide the students staying in the hostel. 3. Loco Parent system is implemented by appointing Teachers as loco parent to a group of 15 to 20 students. 4. Special Classes and Coaching is provided to students to prepare them for competitive exams. 5. Day starts with the physical exercises and Classes will commence at 8.00 AM and academic activities will continue till 10.00 pm in the night. 6. Apart from the academic activities, importance is given to sports and games and other cocurricular activities for all round development of students.